The answer? Custom inflatables! Marketing tents are fully customizable, can be constructed in any size and are easily brandable. At each of 10 locations across the country, women signed up for Diva Dash 5K races featuring fun, challenging and downright hilarious obstacles for ladies only. 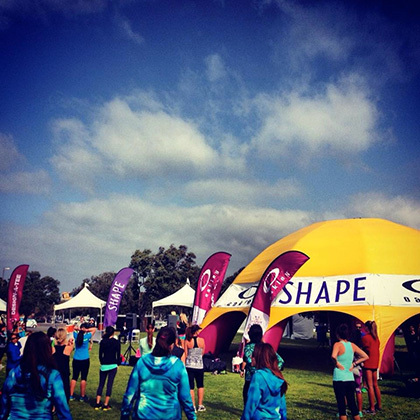 SKA Events made sure the custom marketing tent they commissioned could serve as a rallying point for race attendees. "Landmark worked with us to make sure our client was satisfied with the product. They provided great customer service and got us answers when we needed them," said April Lo, Producer with SKA Events. The tent served to increase foot traffic and interactions with sponsors at the races. The tour is currently ongoing and crisscrossing its way around the U.S. Looking for more creative inflatables? Check out our online galleries!